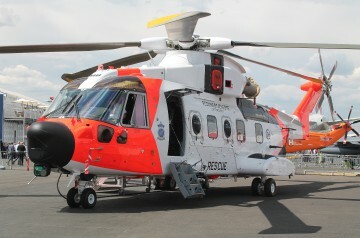 The aircraft is a SAR version for the Royal Norwegian Air Force. NAWSARH stands for Norwegian all-weather SAR helicopter. 16 are being procured. The aircraft can carry 25 people or 12 stretchers. The aircraft systems include an Osprey 30 conformal EASA radar, a Laser Obstacle Avoidance System (LOAM) and an Obstacle Proximity LIDAR System (OPLS). The aircraft has an integrated avionics suite with glass cockpit (5xLCD screens) and is night vision compatible. There is also a mobile phone detection and localisation system. The max range assumes a twin-engine cruise. 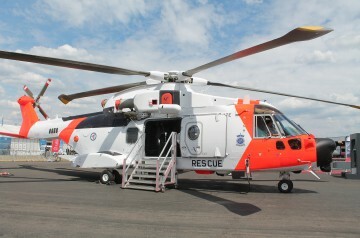 Resources related to the AW101-612 NAWSARH, provided by the Vertical Flight Society. Resources related to the AW101-612 NAWSARH, provided by public sources across the internet.